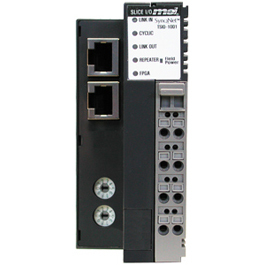 This bus coupler connects the SLICE I/O system to the SynqNet® network. It mounts to a 35mm DIN rail and connects to one or more I/O slices in a modular fashion, supporting up 32 slices with up to 256 digital inputs, 256 digital outputs, 16 analog inputs and 16 analog outputs. RJ45 connectors provide connection to the network and LEDs provide system status.